Key 1 the Magician is the specific beginning of the Tarot, since Key 0 the Fool is said to be dancing everywhere throughout the deck! The background is yellow, the same as the Fool card, again signifying mental equilibrium and intellect at the superconscious plane of mental activity. It also represents the element air and Mercury. So as you can see, we’re still operating at a high level of consciousness. But then we’re just beginning our journey into manifestation. The primary message and functions of this Key are attention, beginning and concentration. This is represented by his stance and his attention to the magical tools on the table. How has he prepared himself? His undergarment is white, signifying purity of spirit needed for this work. His headband is also white, holding back the dark locks of ignorance and inertia. The wings on the band refer to the rhythmic motion of Air and of Mercury, the winged messenger of thought. His main magic consists of what he can do just by wanting to do it. This is symbolized by his red robe which represents his desire nature and indicates action, courage, strength and physical energy. The identity of the Magician is the self-conscious mind – you are the doer. When he is doing Magic he must put on his red robe. This activates the implements on his table. We are the mediator between our inner and outer aspects of Life and this is exercised primarily through our desire nature. The serpent swallowing its tail wrapped around his waist is a symbol of Eternity and regenerative force. So based on this he accepts Eternity as the framework within which he acts. His right hand, the hand of power, lifts up a hollow wand with a bud at the top. This means that your self-consciousness recognizes that all the power you use is derived from the basic Reality of the universe. The Magician shows by this the sublimation of reproductive forces and thereby allows his will to be used as a hollow channel for the Will of God. The wand itself is a phallic symbol. The most powerful force we know is the Life Force. The Magician draws down this power and directs it to the table. The figure eight over his head symbolizes infinity in the rhythm of involution and evolution. We find the Magician in the midst of a green garden of red roses and white lilies which represents the subconscious mind. He cultivates this garden by focusing his attention on it. 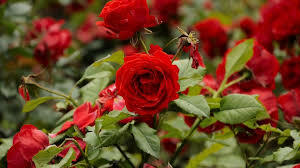 Its flowers are the red roses of human love and desire for action. 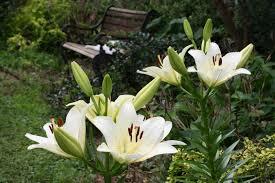 The lilies represent pure thought and divine love, with the green stems and leaves indicating growth. As you may recall green symbolizes the harmony of nature and the planet Venus. And what are the tools of his craft that the Magician will be using? They are spread out on his table, which is likened to the drawing board of an engineer or artist, called a trestle board, where designs or blueprints are made. They represent the four elements or Principles in nature – Fire, Air, Earth and Water. In the full deck of Tarot cards they are the four suits of playing cards. Fire is the white wand signifying Will. Water is the silver chalice of imagination and knowing. Air is the steel sword of daring and formation. Earth is the silent coin of dense materialization. Note that on the coin is the five-pointed star, the pentagram, which is an icon of the human microcosm – the four elements with the upper point being the Spirit of Man. It symbolizes man’s dominion over all the powers of nature. 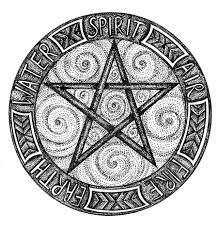 Coins represent success in the world, the pentacle represents spiritual success. There is a natural or der to their use that the Magician must learn. Energy moves in a path through these worlds. The wand is the archetypal world of ideas. 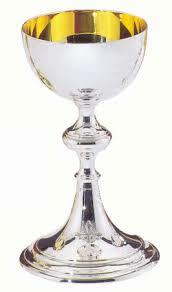 The cup is the creative world of forms. The sword is the formative world of mechanics. 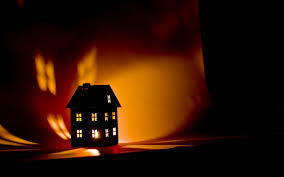 And the coin is the world of result, where we live. There are four occult admonitions: to will (fire), to know (water), to dare (air) and to be silent (earth). We need to cultivate will and accumulate knowledge. To dare means action. And once you set about what you’re going to accomplish, it’s best to keep it to yourself and be quiet! The Magician is practicing a technique known as concentrating in receptivity. Confident expectancy can only be real for a person who has some philosophical background. This is where the use of the Cabala comes in, helping you to expand your mental view of Reality. The Magician’s white garment is his pure nature. The snake is a limit between that and the red robe full of desire. If you want to express yourself in the world of creation, you go through this boundary. You go from one level to another and on the other side is the robe. You go into the land of desire that’s directly tied to the world of creation. We create everything by desiring it. Inside the boundary of the snake there isn’t any desiring. This is where everything is fulfilled by itself, for Eternity. It always has this sense of peace because it’s Self-fulfillment. This is the real condition of Man! The snake swallowing its own tail means it’s Self-fed. When you want more ordinary fun and games you’ll find them outside the serpent boundary! The letter B for Beth means house. Its numerical value is two as it’s the second letter of the Hebrew alphabet. It is also the first point of division from one into two, or duality. In the card Beth means the dwelling place for the Self, the Temple of the Living God. The figure of the Magician represents your house of personality through which the Spirit of your own true Self expresses itself. The High Magic is the transmutation of the personality from its lower forms of expression into a conscious temple of the Holy Spirit.